There are two variants of beta-casein protein in cow milk - a1 and a2. Milk that contains only a2 beta-casein protein is known as a2 milk. A2 milk is obtained from specific breeds of cows that produce the beta-casein protein in their milk with a proline at number 67. These cows are older breeds and are found mostly in India. Some breeds that produce a2 milk include Guernsey, Shahiwal, Gir, and Red Sindhi. A2 milk has more nutritional value than regular milk, since it contains nutrients such as calcium, potassium, vitamin D, and protein. Milk that is free from a1 beta-casein and rich in a2 beta-casein has been found by many people to be easier as far as digestion is concerned. A2 milk reduces heart disease risk and dairy-related inflammation. The production of a2 milk is more in the Asia Pacific region. Due to augmenting applications and rising demand, the a2 milk market is anticipated to proliferate in terms of value and volume during the forecast period. In a2 milk, the bioactive peptide beta-casomorphin-7 or BCM-7 is almost four times less as compared to a1 and regular milk. BCM-7 creates discomfort during digestion. Due to the lack of BCM-7, the demand for a2 milk has increased among consumers. A2 milk is widely consumed in its natural or liquid form. Also, many manufacturers are providing a2 milk in the powdered form, and it is widely used in the production of infant formula. The growing number of dairy products and increasing dairy industries are also boosting the demand for a2 milk, since it is also used in manufacturing ghee, butter, yogurt, ice cream, cheese, milk powder, and many other products. A2 milk is used in bakeries and confectioneries, and it is also used for manufacturing milk-based beverages. Due to this, it is expected that there will be further launches of new dairy-based products with natural ingredients, such as a2 milk, which is anticipated to drive the growth of the global A2 milk market during the forecast period. A2 milk is produced mostly in the Asia Pacific region due to the presence of the a2 breed cows, and also due to the rising demand for dairy products in this region. Problems related to milk digestion are increasing, globally, among consumers. Many people are afraid to consume milk as they experience gas and bloating after consuming regular milk or milk that contains a1 beta-casein protein. A2 milk is found to be easier as far as digestion is concerned, since it contains only a2-beta-casein protein. A2 milk can be used as alternative milk for infants. As we all know, mother’s milk is very important for infants to ensure good health and growth. But there are many cases where mothers are unable to feed a sufficient amount of milk to their children. In such cases, a2 milk is a great alternative, as it is quite comparable to goat’s and mother’s milk. Also, many manufacturers are using a2 milk for the manufacturing of infant food. Many new infant food products are being launched every year by various manufacturers, which is boosting the share of a2 milk in the market. An increasing number of people across the globe are suffering from heart diseases. Also, a large number of people are suffering from dairy-related inflammation by consuming regular milk. A2 milk reduces the risk of dairy-related inflammation and heart disease among consumers. Milk is a daily food ingredient that is used in various dairy products. Milk is consumed globally as a healthy food, since it contains various nutrients that are necessary for human as well as animal health. One of the major nutrients in milk is fat, which is considered to be good fat. The fat content in a2 milk is higher as compared to regular milk. In regular milk, the fat content is around 3.6%, whereas, in a2 milk, it is around 4.8% fat. The trend of eating healthy food is increasing among consumers, globally. Milk is considered to be one of the most consumed food, globally. Milk is consumed on a large extent, as it is considered as a healthy product. But there is an increasing number of people who are not able to consume milk and milk products due to indigestion problems. A2 milk is easier to digest, and that’s why it has great demand among consumers as a healthy food that can be digested easily. Bound to all the above driving factors, it is anticipated that, the global A2 milk market would proliferate in terms of volume and value during the forecast period. A2 milk is obtained only from those breeds of cow which have two pairs of a2 allele. Some breeds that produce a2 milk include Guernsey, Jersey, and Gir. A2 milk has more fat content than regular milk. It also contains other nutrients such as calcium, potassium, vitamin-D, and protein. Milk that is free from a1 beta casein and rich in a2 beta-casein has been found by many people to be easier as far as digestion is concerned. A2 milk reduces heart disease risk and dairy-related inflammation. A2 milk is also used in infant nutrition as it is quite comparable to mother’s milk. Due to the rising demand among consumers, a2 milk market is anticipated to proliferate in terms of value and volume during the forecast period. 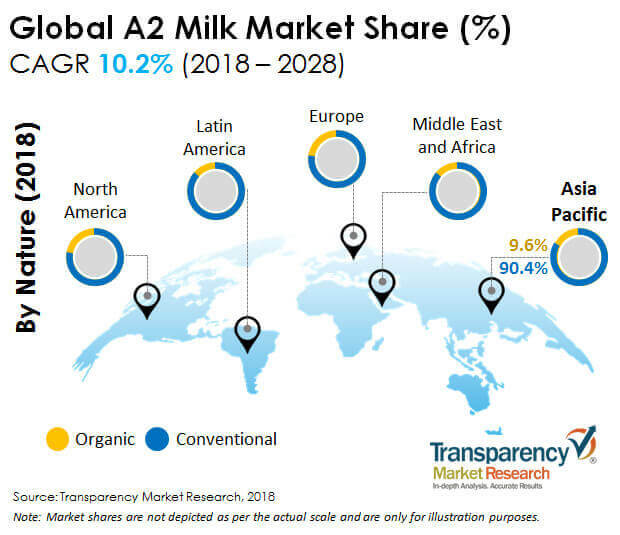 The proposed market report of Transparency Market Research on the global a2 milk market, evaluates opportunities in the current scenario, and provides latest updates and detailed insights corresponding to different segments involved in the global a2 milk market during the forecast period 2018-2028. The a2 milk market report further indicates the estimated data for 2018, and forecast data up to 2028 in terms of value (US$ Mn) and volume (MT). In terms of value, the a2 milk market is anticipated to increase at a CAGR of 10.2% during the forecast period. The present study exhibits the market dynamics and trends of the a2 milk market in regions such as North America, Europe, Latin America, Asia Pacific, and the Middle East and Africa. The report includes the market growth drivers and challenges for the global a2 milk market, and their impact on each region during the forecast period. The report also comprises the study of the drivers, restraints, threats, and opportunities for the a2 milk market, to provide a substantial view. It also includes value chain analysis and opportunity analysis of the market. The report explores the global a2 milk market for the period 2018-2028. The principal objective of the a2 milk market report is to provide insights into the key developments in the market that are constantly supporting the transformation of global businesses that are associated with a2 milk. It is very important to consider that, in an ever-wavering economy, we provide the estimated (Y-o-Y) year-on-year growth rate in addition to the Compound Annual Growth Rate (CAGR) for the overall forecast, to understand the better analysis and evaluation of the global A2 milk market, and to discover justifiable opportunities. The unique key feature of this report is that, the evaluation of the global a2 milk market and its relative revenue forecast is carried out in terms of absolute dollar opportunity. This is usually not considered while forecasting overall market value. Absolute dollar opportunity analysis is very crucial in evaluating the intensity of opportunity that a provider can observe to execute, as well as to contrast the potential resources from a sales perspective in the global a2 milk market. The a2 milk market report starts with an elaborate executive summary, the market definition of various segmentations that are included, and their respective shares in the a2 milk market. The report also provides insights regarding the major macroeconomic factors that have a significant effect on the growth of the a2 milk market. The market report further emphasizes the various dynamic factors that influence the a2 milk market, which include the drivers, restraints, opportunities, and trends in the global a2 milk market. The report further underlines the study of the present issues with industrial processing, and opportunities for the a2 milk market. It also includes a value chain analysis that provides a comprehensive view of the overall profitability from the raw material supplier to the final end user in the a2 milk market. In order to give users a clear view of the global a2 milk market, we have exhibited a competitive analysis of key market participants and their strategic developments. The competitive dashboard presents a detailed comparison of the global manufacturers of a2 milk on vital parameters such as product portfolio, total revenue, key developments, and key strategies. The study presents the a2 milk market attractiveness analysis by nature, form, application, packaging, distribution channel, and region. To analyze the overall market size of a2 milk, the report considers various preliminary aspects based on secondary research. Furthermore, it highlights quantitative estimation such as market share by form, nature, application, packaging, distribution channel, and region, and other qualitative data from primary respondents, which have been integrated to arrive at unambiguous and accurate market estimations. The forecast presented in the a2 milk market report arrives at the total revenue being generated, and the expected revenue contribution in the future by the global a2 milk market. Detailed profiles of various companies that manufacture a2 milk are included in the report to evaluate their developmental strategies, product offerings, and recent developments, as they have a significant role in the A2 milk market. Important market players covered in the a2 milk market report are The a2 Milk Company Limited, FREEDOM FOODS GROUP LIMITED, Fonterra Co-operative Group Limited, Vietnam Dairy Products Joint Stock Company, Gujarat Cooperative Milk Marketing Federation Ltd., Provilac Dairy Farms Private Limited, Vedaaz Organics Pvt. Ltd, Ratnawali Dairy Products LLP, Erden Creamery Private Limited, and others. The subsequent sections analyze the global a2 milk market on the basis of region, nature, form, packaging, application, and distribution channel.